The design of the Palmilla is bold in its design of homes on showcase. It is situated among the most breathtaking shimmering lakes and original metal sculpture creations and exquisite plush desert landscape. This wonderful community has gotten national acclaim. The community of Palmilla is the winner of the “Best in American Living” award, which is a prestigious award given by the National Association of Home Builders in conjunctions with the Professional Builder Magazine. 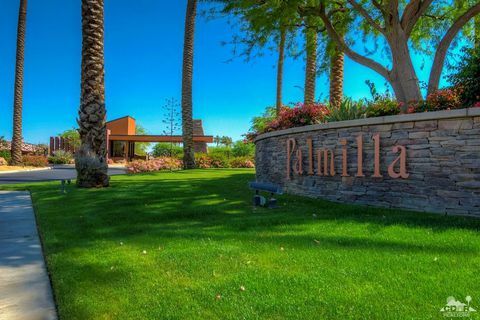 Palmilla was also singled out as the “Best Single Family Detached Community in America” by the well known Builders Choice. Recently, the community of Palmilla won the 2005 Honor Award for Best Design by the American Society of Landscape Architects. Homes offered in Palmilla La Quinta bring award winning features to the homeowner including elegant French doors, stone veneer, interlocking pavers, lush landscapes, and spacious covered patios. The interiors are expertly crafted to include raised fireplaces, built in buffets, closet organizers, sunken wet bars, and dramatic coffered ceilings. The lavishness of the master suites can include the addition of relaxing hydro system tubs, beautiful, rich cherry cabinetry, separate showers with frameless clear glass or glass block, and large walk in closet spaces. Each of the homes in Palmilla La Quinta are constructed of the highest quality materials and include entertainment packages with custom spas and pools, fine appointments, built in barbecues, and outdoor fireplaces. You can also choose to upgrade the amenities to provide your home with a gourmet kitchen. Each home is created especially for the taste and preferences of the discriminating buyer. If you would like to see property in Palmilla La Quinta please call us at the numbers below. Were committed to helping you find the home of your dreams. With over 20 years of experience in the Luxury Real Estate market, Elaine truly enjoys helping people in the process of buying or selling a home.